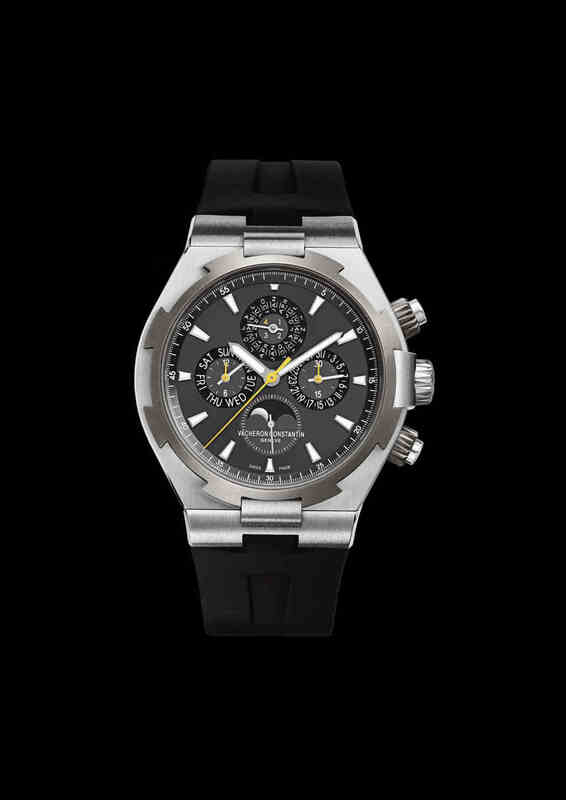 This year, Swiss watch manufacture Vacheron Constantin is enriching its Overseas collection by introducing the Overseas Chronograph Perpetual Calendar “Boutiques Exclusive” model. This original perpetual calendar chronograph is equipped with the remarkable Calibre 1136 QP within a steel case enhanced by a titanium bezel. The Overseas Chronograph Perpetual Calendar “Boutiques Exclusive” is issued in an 80-piece limited edition exclusively reserved for the 27 Vacheron Constantin boutiques around the world. 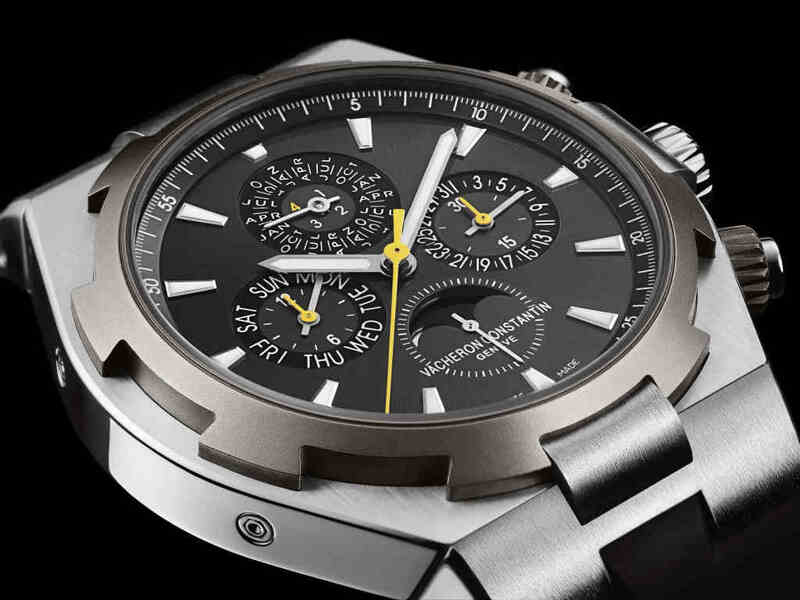 The sporty Overseas collection is the only line of watches from Vacheron Constantin to offer steel models. Overseas line was enriched in 2009 with entirely grey-clad versions combining steel and titanium and featuring slate grey dials teamed with grey alligator leather or rubber straps. In 2011 this line welcomes an exclusive model associating two major complications: the chronograph and the perpetual calendar. At the heart of this exceptional model beats the 228-part Calibre 1136 QP, a mechanical self-winding movement – as one would expect from a sports watch – beating at 21,600 vibrations per hour and endowed with an approximately 40-hour power reserve. In addition to the hours, minutes and small seconds at 6 o’clock, Calibre 1136 QP powers the chronograph function as well as the perpetual calendar indicating the day of the week, the date, and the month on a 48-year cycle, complete with leap-year display and moon phases. This newcomer to the Overseas collection comes in a generous 42 mm case that is water-resistant to 15 bar (approximately 150 metres). The collection’s emblematic bezel inspired by the Maltese Cross is made in titanium – as are the pushpiece guards – while the steel case incorporates a soft iron cage protecting the mechanical movement from magnetic fields. Another signature feature of the Overseas collection, the screw-down caseback features a medallion engraved with the famous Amerigo Vespucci three-masted sailing ship. Admirably complementing the chromatic theme of the steel case and titanium bezel, the sunburst satin-brushed slate grey dial is distinguished by 18-carat white gold applied hour-markers highlighted by a white luminescent substance. A first for Vacheron Constantin, the use of yellow to underscore the three hands relating to the chronograph function lends an additional dynamic touch and guarantees excellent readability. 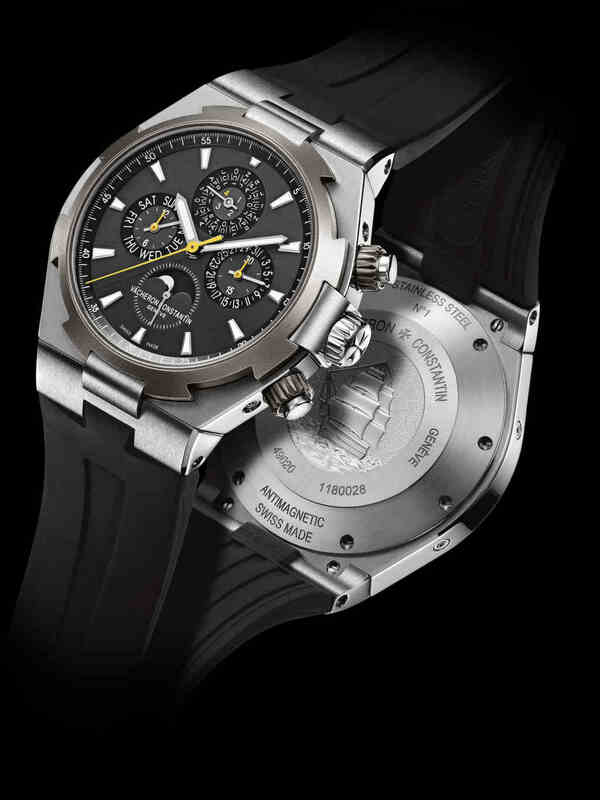 The Overseas Chronograph Perpetual Calendar “Boutiques Exclusive” is delivered with two straps: one in black vulcanised rubber and the other in dark grey alligator leather. A triple-blade double-pusher folding clasp guarantees secure and comfortable wear for the owner of this exceptional model. Issued in an 80-piece limited edition.